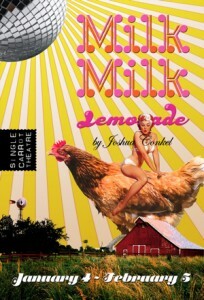 The Reviews are in: Critics Love MilkMilkLemonade! Come see what all of the fuss is about! Tickets are selling very quickly, so get ’em while you still can! Running NOW though February 5th, 2012.
https://singlecarrot.com/wp-content/uploads/2017/08/logo-300x300.jpg 0 0 Alix Fenhagen https://singlecarrot.com/wp-content/uploads/2017/08/logo-300x300.jpg Alix Fenhagen2012-01-26 19:30:462018-08-22 19:09:22The Reviews are in: Critics Love MilkMilkLemonade! Thank you to University of Maryland Francis King Cary School of Law, Why Murder?, Anna Ditkoff and all of those who joined us on Wednesday, January 25th to acknowledge those lives lost to murder in Baltimore City in 2011. It was a solemn but inspirational event. If you’d like any more info on any of the participating oraginzations, see the links below. Thanks again and here’s to a peaceful 2012.